patch andi: Have you met Jen? I first met Jen when our kids were in swimming lessons together. We soon discovered each others' crafty sides and enjoyed having crafty catch ups each week while the kids swam. 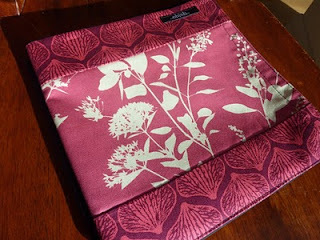 Jen's blog is called Oh Joh and she is a great maker of aprons, clothes, cushions and other crafty delights. Jen is in the process of making her first quilt ... for her son. She has filled it with so many details that have meaning for him. He loves words and numbers. He loves Roald Dahl (if you look closely, you'll see she has embroidered icons from some of her son's favourite stories). He loves cars. And .... he really loves his mum!! 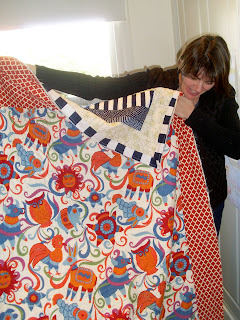 She has put so much of herself into this quilt. And have a look at the divine fabric she has used on the back!! The problem arose with the binding. Jen declared she was 'making it up as she went along'. So, I insisted she come over for a crafty catch up so we could bind her quilt together. That day was yesterday. Jen arrived with yummy danishes .... a woman after my own heart ....and we set to work! 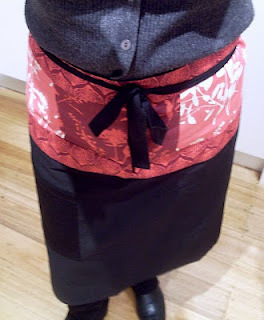 One of her gorgeous aprons. I popped it on straight away!! Thanks Jen. I had a lovely morning!! PS Jen has also posted about our morning here. Lucky you, love the apron. Thanks for the link - heading straight over. 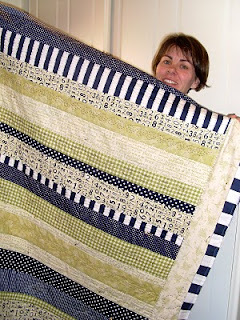 Well I have to say she did a marvelous job on her first quilt and how fun that you were able to work together on the binding. Love the apron too! You are lovely!!! Thanks for the plug. And I'm still in awe of how confident and quick you are on that machine and that rotary cutter. Amazing. How many times can person say thankyou before it become ridiculous? THANKS, THANKS & THANKS!!!!!!! That apron is so very you! !